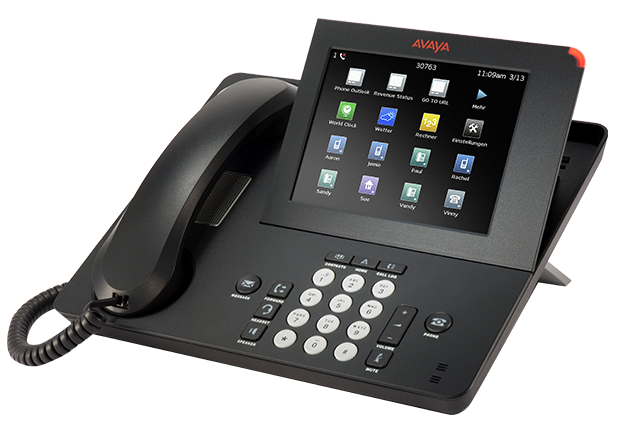 The Avaya 9670 IP phone is the flagship model in the large 9600 IP series lineup. With its massive colour touch screen, choice of handset colours and everything else thrown in as well, it’s a very impressive IP phone. For more detailed information about the 9670G phone please read below. The Avaya 9670G IP handset is the top of the line model in the Avaya 9600 IP phone series . You've only to look at it to know it's something special. It offers one of the largest touch colour screens of any manufacturer and it looks amazing. That said, the large screen really is designed for people that either love having the best or will actually use it for internet browsing, instant messaging, collaboration for features like Microsoft outlook and calendar integration and the like. That's why you get features like a virtual keyboard that presents on screen when required. Even though it's top of the range it isn't designed for receptionists - other models like the 9650 and 9641G are better suited. The 9670 is designed for high powered executives. The truth is very few companies will ever have a 9670 phone in their line-up because of the price. With everyone using smart phones, PC and tablets, are you going to need your phone for that also? To the right person it does offer some very cool features like Bluetooth integration as well as voice recognition for up to 250 speed dial numbers. This is great for heavy users of the phone - just say who you want and presto..... If you love touch screens then the 9621 and 9641 are excellent alternatives at up to half the price. p>The HD wideband audio quality on the Avaya 9670 handset is true to life and a premium IP experience. This sound quality also extends to the excellent built-in speakerphone, for clearer conversations and voice conferencing. The 9670 touch screen capability also makes navigation a breeze, especially as the handset automatically chooses the appropriate one-touch menu prompts for individual situations, making for a truly intuitive experience (context adaptive logic). This means that when you are using a feature, like making a phone call, it will understand what you're doing and present the most logical options on screen that relate to it. For example, you would see transfer, hold, conference, end etc. This feature is available on most 9600 series phones but on the touch screen it's larger and easier. This type of intelligence makes using the 9670 handsets a breeze day to day. No more having to navigate around to find what you want. The 9670 IP phone also comes with Bluetooth built-in for seamless convergence of computers as well as and wireless headsets. Like all IP handsets, the 9670 is automatically recognised by the Avaya IP phone system the moment it is plugged into an existing Ethernet port. All you do is take your 9670 handset with you, plug it in, and away you go. You don't have to swap extension numbers or reprogram the 9670. This type of feature also enables staff that commune between locations to easily login to either their own phone, or an available IP phone, and have all their settings instantly available. No more call forwarding etc as the phone picks up and creates you as your normal extension. Designed for managers the 9670 really takes the IP experience to a whole new interactive level. If you'd like to know more about the Avaya 9670G IP handset, or any other Avaya models, please call us for a no-obligation demonstration today.